*This is the old Batch of the Vintage Tan Leather - only a few sizes left in this. 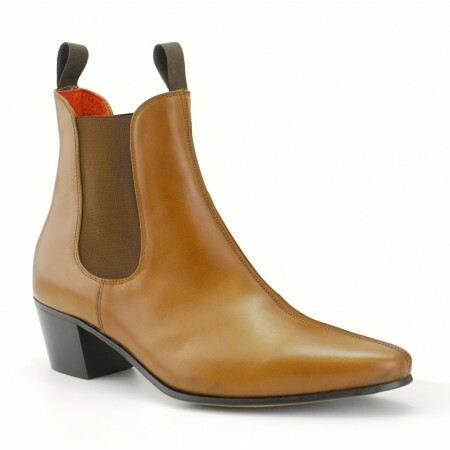 Taken from the design of the flamenco boot with a high Cuban heel...Â this was one of Beatwearâ€™s first boot styles, based on the original patterns and lasts from the 60's, just tweaked a bit so that they are actually comfortable to wear now as so many of you tell us they werenâ€™t back then!! All our Beatwear boots are expertly handcrafted from start to finish in our special Italian factory using only the best premium calf or suede leathers. They are all lined with beatwear's trademark 'red' supple leather for your comfort and finished with a hard wearing leather sole. The sole is stamped with Beatwearâ€™s logo so you know that they are a genuine Beatwear product and that you can be sure that are buying quality.